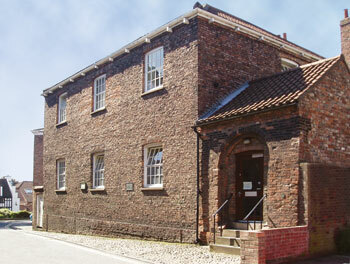 A surviving link with the early days of Methodism in York, this former chapel dates from 1759. During a visit to York on 25th April, 1751, John Wesley arranged for services to be held in the Countess of Huntingdon’s Chapel which stood in a court off College Street. The following year services were transferred to a building adjoining the north-west angle of the Minster which some time later was converted into a public house with the sign of The Hole In The Wall. 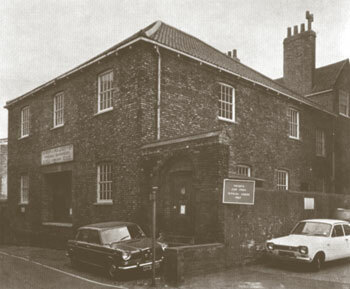 Increasing in numbers, members of the York Methodist Society began to use a building on the corner of Patrick Pool and Newgate, which was entirely rebuilt in 1963, with the exception of a portion of the south-west corner of the ground floor, which carries a commemorative plaque. Wesley preached in this building on 9th May 1753, and repeatedly recorded this room as “the oven”. On 11th July, 1757, Wesley preached at the north end of Blake Street, and on that occasion a subscription fund was opened for the building of a permanent chapel. A further two years were to pass before a site was found, covering about 800 square yards at the junction of Aldwark and Peasholme Green. It was bought on 27th February, 1759, by John Heworth, a carpenter, from the feoffees of All Saints’ parish on a 99-year lease at £9 a year. The Methodists worked so quickly on this, their first meeting house to be built by in the city, that when Wesley came to York again on 19th April, 1759, he was able to preach in the shell of the new building. Reaching York on 18th April, he held a service the same evening in Pump Yard, and the following day recorded in his journal: “I visited two prisoners in the Castle which is, I suppose, the most commodious prison in Europe. At six I preached in the shell of the new house to a numerous and serious audience”. The completed chapel, which was opened by Wesley in the July of the same year, had a gallery only at one end, the body being filled with plain benches to seat about 400. Lighting was by candles. By 1775 the congregation had managed to afford the £78 needed to build side galleries which increased the building’s capacity to 500. The chapel was sold in 1805-06 for £530, a sum which went towards the cost of the New Street Chapel. By 1885 the largest upper window which lit the gallery had been replaced by folding doors leading to a hayloft, while the basement had been converted into four tenements reached by side passages. 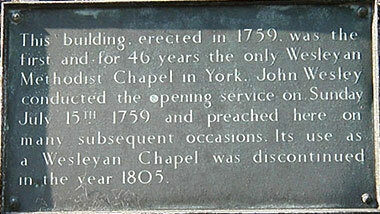 The building was renovated in 1955 and in March of that year a plaque was placed on the wall commemorating the use of the building as a chapel: “This building, erected in 1759, was the first and for over 46 years, the only Wesleyan Methodist Chapel in York. John Wesley conducted the opening service on Sunday, 15th July, 1759, and preached here on many subsequent occasions. Its use as a Wesleyan Chapel was discontinued in the year 1805”.